I got this great book for Christmas called American Food Writing: An Anthology: With Classic Recipes. I've only read a bit of it, but it's a collection of short stories and excerpts and recipes by various authors, ranging from Thomas Jefferson to MFK Fisher to John Steinbeck to Alice Waters. While reading it today I came upon a recipe for chowder, which I was planning on making for dinner (I was planning on clam, this recipe was for fish). This recipe, more a method, is from 1830 and by a Lydia Marie Child (no relation that I can tell to Julia). While I didn't follow the recipe ingredients (I used what I had), I was intrigued with Ms. Childs process. Instead of adding ingredients individually, she layers them, covers the pot, and lets the soup cook until done. Interesting! No process of cooking and stirring and adding, just layers like a casserole and then some cooking time, and voila! Chowder! I tried it and while there was a bit stuck to the bottom of the pan (I cooked it on high accidentally for a while), it was delicious. And easy. And fairly quick. Next time I might add some bacon (cooked first and left in the bottom of the pan) and onions (I was out), but maybe not! It was perfect as it was. 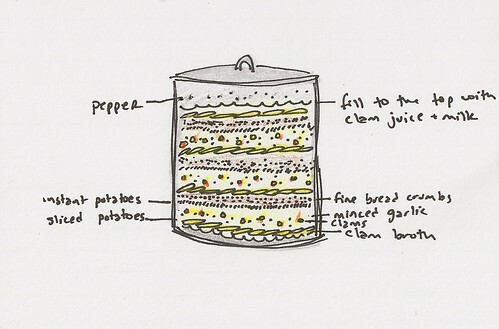 In a soup pot, put a bit of clam juice, and then spread a layer of potatoes. Sprinkle with a handful of clams, some minced garlic, and a bit of pepper. Next spread some instant potatoes, followed by breadcrumbs, then repeat until you've used up all the clams. Finish with a layer of potatoes, sprinkle a bit of pepper on top, then pour on all your clam juice and fill to the top of the last layer of potatoes with milk. Heat slowly to a simmer, then cover and go wash some dishes or watch tv for half an hour. Come back, taste for salt, and your chowder should be done! It will be peppery and creamy and delicious. I drew it, I thought it would be easier to visualize than my explanations, which sometimes I have trouble with!